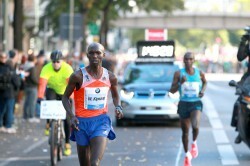 The world marathon record tumbled yet again as Kenya’s Wilson Kipsang triumphed at the 40th edition of the BMW Berlin Marathon. 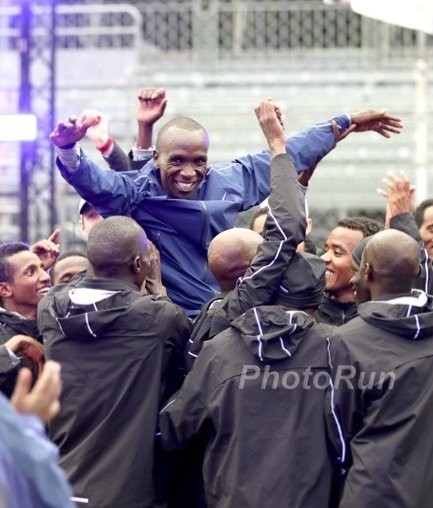 Running in ideal conditions, he crossed the finish line near the historic Brandenburg gate in two hours, three minutes, and 23 seconds—15 seconds under the old record set by his fellow countryman Patrick Makau, also in Berlin, two years ago. Runner-up Eliud Kipchoge improved his best to 2:04:05, moving to fifth on the all-time list and establishing another kind of record: No marathoner has ever run so fast without winning the race. Completing the Kenyan sweep was Geoffrey Kipsang, who finished third in 2:06:26. The fastest woman was another Kenyan marathoner, Florence Kiplagat, who ran to her second victory in Berlin after winning in 2011. The 26-year-old won in 2:21:13, ahead of her compatriot Sharon Cherop (2:22:28). Germany’s Irina Mikitenko ran a tremendous race to cross the finish line in third place. The 41-year-old improved the Masters world record (age group 40+) with her time of 2:24:54, shattering the previous best of 2:25:43 hours. 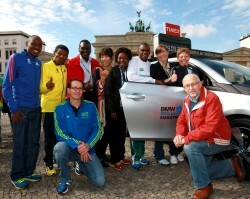 The first Berlin Marathon took place in 1974, with just 286 runners. 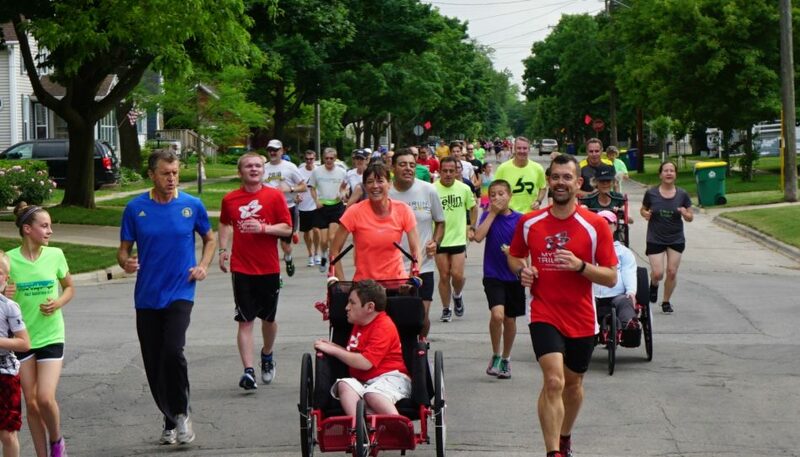 In contrast, this year 41,120 runners from 119 countries registered for the anniversary edition of the race. 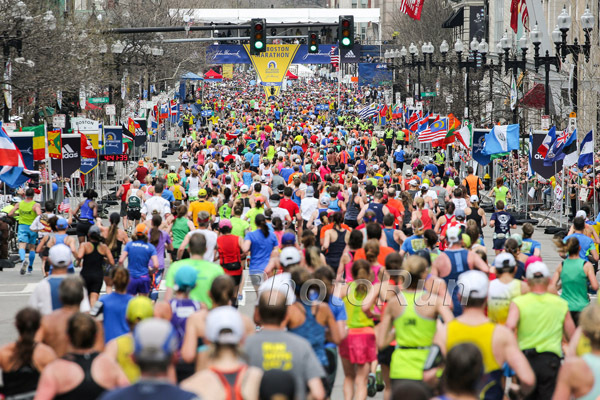 An estimated one million spectators lined the course of the World Marathon Majors (WMM) event, which passes landmarks such as the Victory Column, the Reichstag, the Kaiser-Wilhelm Memorial Church, and the Potsdamer Platz. Conditions were just about ideal, with temperatures hovering between 46 and 52 degrees Fahrenheit and blue skies. Windy conditions only affected the race in the closing stages. Incredibly, this was the ninth world record set in the history of the Berlin Marathon—a number that makes it the world’s premier event for fast times: Berlin was previously tied with London’s Polytechnic Marathon, which no longer exists, with eight world records to its name. The leading men seemed to be on world-record pace right from the start. They passed halfway in 61:32 minutes—12 seconds faster than Patrick Makau’s 2011 mark. But by 25K the pace was only five seconds ahead, and at 30K Wilson Kipsang had fallen behind Patrick Makau’s pace for the first time. Patrick went through in 1:27:38 in 2011, which is still a world record for 30K, while this year’s lead group was timed at 1:28:01. The last pacemaker, Philemon Rono, dropped out shortly after 30K leaving at the front the three favorites: Wilson Kipsang, Eliud Kipchoge, and Geoffrey Kipsang. Initially the trio failed to make up time in their pursuit of the world record. When they reached 35K in 1:42:36, they were exactly 20 seconds slower than Patrick Makau when he broke the record after going head-to-head with Haile Gebrselassie. But then Wilson Kipsang rose magnificently to the occasion. 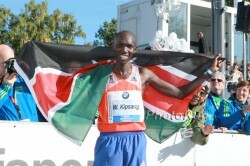 The 31-year-old double winner of the BMW Frankfurt Marathon, who missed the world record by just four seconds in the race along the river Main in 2011, made his move and Geoffrey Kipsang fell behind. For a while Eliud Kipchoge seemed to still be in contention, but the former 5,000m world champion running his second marathon could not sustain the torrid pace to the very end. 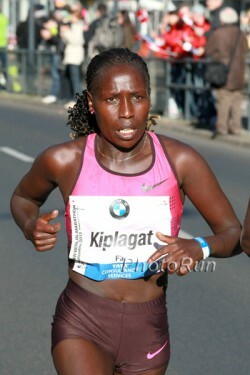 In the women’s race Florence Kiplagat, the winner two years ago in Berlin with 2:19:44, also set a fast pace from the start. At first her splits were pointing to a finishing time of sub-2:19, but the Kenyan star began to hold back after 15K, making the course record of 2:19:12 increasingly out of reach and allowing Sharon Cherop to make up time. Florence Kiplagat went through halfway in 69:48 minutes but she left her decisive move until the closing stages, breaking away from Sharon Cherop with about 5K to go. “I felt strong in the first half of the race, but then I started getting problems with my right foot, I had a blister which forced me to slow down,” explained the women’s champion, whose time of 2:21:13 was still the third fastest in the world this year. “I hope that I’ll have the chance to run in Berlin again.” Sharon Cherop improved her personal best with 2:22:28 for second place. Once again, home country favorite Irina Mikitenko ran a clever tactical race, maintaining a very even pace and electing not to match her rivals’ initial fast speed. 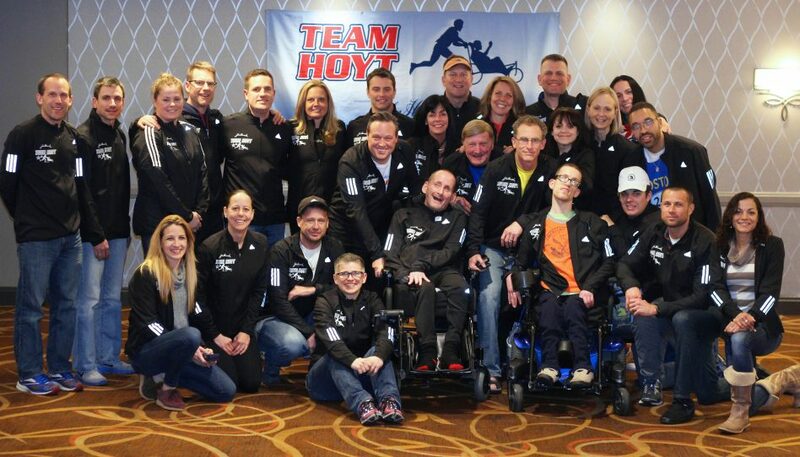 “From the start I made a conscious effort to hold back because of the wind. Perhaps I could have run faster, but I’m very happy, of course, to have this Masters world record,” said Irina, who covered the first half in 1:12:24 and was fourth for long periods. Closest rival Isabellah Andersson of Sweden had to drop out before 30K, and Irina was never passed again. 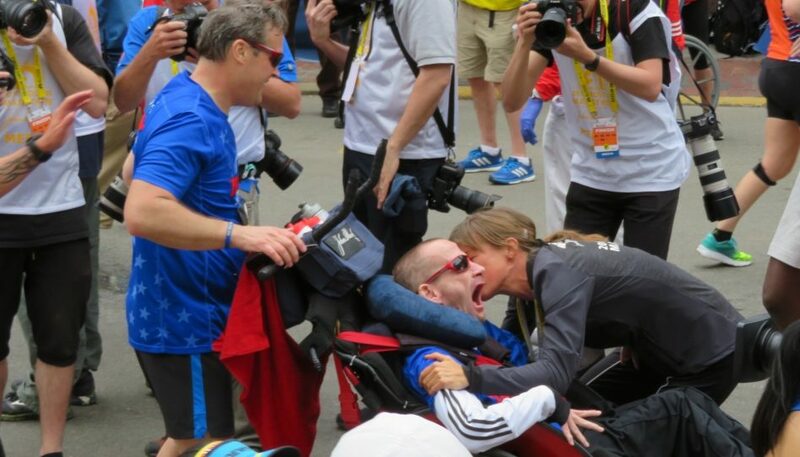 “A Masters world record and third place, what could be better than that?” said Irina, who made a big improvement to the world record for the 40+ age group held by Lyudmila Petrova of Russia, who ran 2:25:43 five years ago in New York.